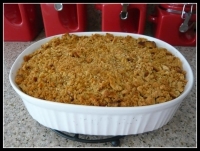 Brown in 1 stick margarine, 1/2 cup chopped onions and 1/2 cup chopped green pepper. Add 2 cans cream of mushroom soup, almonds, pimento and mushrooms. Mix and add 4 cups cooked chicken and 1 box wild rice, cooked. 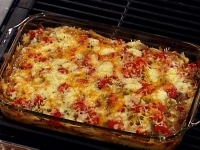 Place in greased 3-quart casserole and top with 1 cup grated Cheddar cheese. Bake at 350° for 30 minutes.